In 2015, breast cancer accounted for an estimated 26% of all new cancer cases affecting women. As a plastic surgeon devoted to the welfare and safety of my patients, I am dedicated to providing accurate information about breast augmentation so you can make an informed decision about whether to proceed, or not, with your surgery. I answer two common questions: "do breast implants cause breast cancer?" and "what is the impact of mammograms on breast implants?" You should be aware, though, that there has been new evidence suggesting that there may be a possible link between breast implants and anaplastic large cell lymphoma. Since 2011, the FDA has been examining the possible link between breast implants and anaplastic large cell lymphoma (ALCL). ALCL is a rare type of non-Hodgkin’s lymphoma that affects the lymphatic system. Of the over 6 to 10 million women around the world who had breast implants from 2010 to 2015, medical device reports stated that about 250 women developed ALCL. Unfortunately, this figure is not reliable because medical device reports can be unreliable and biased. In addition, one study published in the journal, Breast Cancer Research and Treatment, was unable to prove the link. Nonetheless, it is important that you know that the FDA continues to caution patients of "a very low but increased risk." The FDA recommends that women with breast implants continue to monitor their condition as usual, without any special changes. 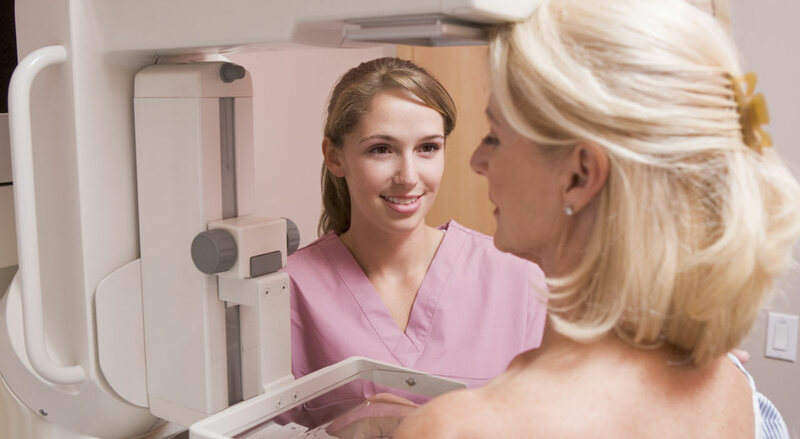 This includes at home self-checks, periodic MRIs (which are considered the best way to detect silicone implant ruptures) and routine mammograms. Do breast implants make detecting breast cancer harder? The National Cancer Institute recommends that all women 40 years old and over should have a mammogram once every year, or every other year. For women who have had breast augmentation, there is concern that breast implants can make detecting cancer more difficult. This is because the presence of an implant can get in the way during examination. Even so, it is still possible to get accurate and precise testing if it is performed by a technician experienced in performing mammograms on women who have breast implants. “Implant displaced” views may be performed. Also known as Eklund views, after the doctor who first described it, involves moving the implant in a manner that increases the amount of tissue visible. More views of the breast tissue may also be taken. Silicone is a safe material that has been used medically for decades to construct implantation devices. Silicone does not cause cancer. 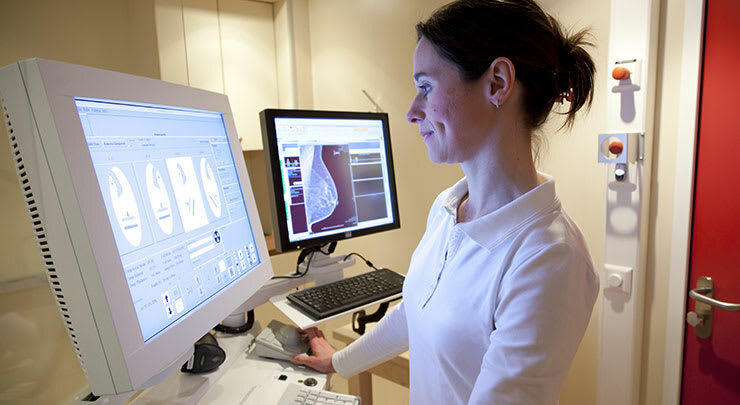 Do mammograms cause implants to rupture? Another concern often expressed is whether mammograms can cause implants to rupture. There are a couple of studies suggesting that ruptures may occur during mammography, but you should be aware of this fact: the longer you have implants, the higher the risk of rupture. Most women get breast implants in their 20s and 30s, when mammograms aren’t regularly performed. By the time a woman starts getting annual mammograms in their 40s and beyond, the implants will have aged considerably and this could be the reason why many ruptures occur. As a result, mammograms may not be the true cause of a rupture. Rest assured, breast implant manufacturers do routinely test the durability of their products. 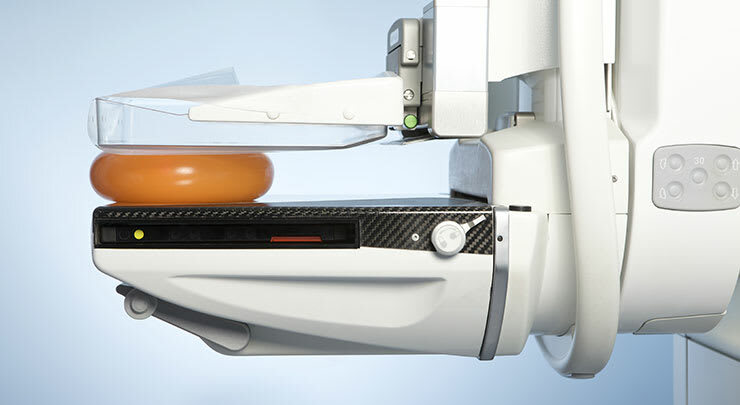 Tonnes of pressure, far, far more than what is applied during a mammogram, are forced upon an implant during testing to ensure that their product can withstand it. 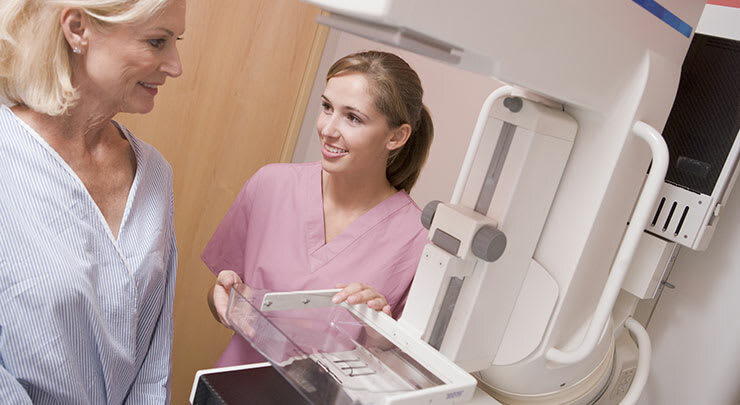 It is important that you undergo routine mammograms as part of your breast cancer screening. If you are concerned about ruptures because of the age of your implants, you may want to consider getting them replaced before they become a problem. Your radiologist doesn’t even have to ask you what type of implant you have because it can be distinguished from your mammogram: saline implants have a valve and the filling has the same density as water. Silicone, on the other hand, doesn’t have a valve and has a higher density filling. Normal saline and silicone implant shells appear round or oval and are smooth, with the same uniform shade. In the event of a saline implant rupture, folds form in the shell as it deflates. On the other hand, a silicone implant rupture may be a little more difficult to detect. There are two types of silicone ruptures: extra capsular and intracapsular. The body naturally forms a fibrous capsule around a breast implant. If filling extends beyond the shell and the fibrous capsule, then it is known as extracapsular. If a silicone implant ruptures and the filling pushes out beyond the shell but remains within the capsule, it is known as intracapsular — an MRI would be more effective in detecting this type of rupture. Breast augmentation can dramatically improve your body contour, giving you a fuller, more feminine appearance that can improve your self-esteem. However, it is important to know as much as possible about the procedure before you proceed.